South Jersey's Matt Adams faced down the windchill along the Cooper River Saturday morning while wearing shorts. That sums up the weekend forecast. Matt Adams, 33, didn't seem to care that Saturday's high is forecast at just 22 degrees. 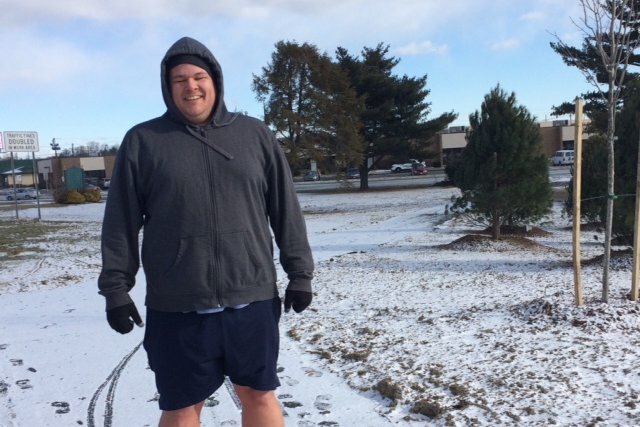 The Collingswood resident ran the path around the river clad in shorts – claiming his legs get too hot in pants. He's in training for his first foot race and had taken Friday off, so he felt obliged to get out and move on Saturday. Tonight, a low of 4 degrees is forecast. A northwest wind of 22 to 28 mph is expected Saturday, with gusts up to 46 mph. That means a wind chill of zero during daylight Saturday. On Saturday night, the windchill is forecast at minus 12. The daytime windchill Sunday is forecast at minus 11 degrees. But with winds dropping Sunday evening, that should improve. The coast has a gale advisory up all weekend. There is a small chance of snow – isolated squalls – Saturday and then another chance on Sunday after 1 a.m. The real snow worry is Monday, with snow and sleet possible before 1 p.m., then rain after 4 p.m. Less than half an inch is likely. The good news is that on Monday it will hit 36 degrees and will not go below 35 degrees Monday night. Heavy rain is in the forecast for Tuesday, but the high should hit 51 degrees. At the Reading Terminal Market, Alex and Anneliesse Lohmann, in from New York, were feeling too warm after eating hot and sour soup and fried chicken. "That's why we are getting ice cream," she explained, clutching her coat and lined up at Bassett's for a cooling scoop.